Sun., May 15, 2016, 5 p.m.
Friday, 5:30 p.m.-7 p.m.: Wrap-up party at River City Brewing, 121 S. Cedar St.
Sally Phillips is retired and lives way up on the South Hill. Still, she’s ridden her bike as a commuter for decades. 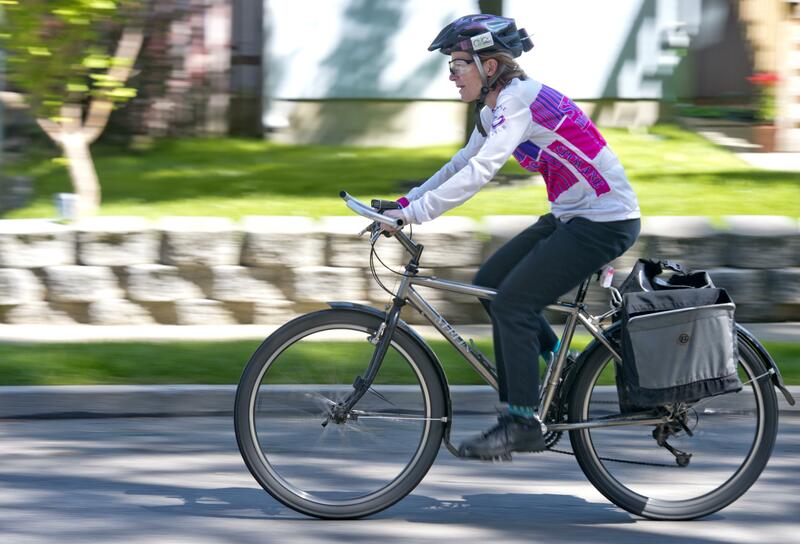 Phillips, 68, is also leading Bike to Work Week in Spokane, but she insists it’s so much more than biking to work, or even a week. Instead, Phillips and others are pushing a new moniker: Bike Everywhere Month. Beginning Monday with a pancake breakfast in Riverfront, this week’s bicycling events range from the solemn – a ride of silence on Wednesday to remember cyclists killed in collisions with motorists – to the tipsy, as Friday night will see a pizza party at River City Brewing. But overall, the week is meant to encourage people to try commuting by bike. And Phillips is happy to share a lot of reasons to give it a shot. Phillips has been commuting by bike since the 1980s, and said she is encouraged by the growth in cycling infrastructure in Spokane, but acknowledged the “cynicism” she first had over the city’s comprehensive plan, which guides development and encourages pedestrian and bicycle infrastructure over vehicles. But what really excites Phillips is the nearly 9-mile bikeway the city is constructing that runs from the Nevada-Lidgerwood neighborhood to East Central. It begins up north with the Addison-Standard bike corridor, a newly painted 5-mile segment of bike lanes. The corridor connects with the planned Cincinnati Greenway near Gonzaga University, which will discourage car traffic in favor of walkers and riders. Finally, it ends with the Ben Burr Trail, which is scheduled to be paved, widened and lengthened this year. The expansion of bikeways in town has heartened Phillips, and she believes it will encourage more people to ride. Published: May 15, 2016, 5 p.m.